Denison returned to the north in 1947 and worked on the cat trains supplying the mining camps with equipment. He eventually became associated with Byers Transport Limited, with whom he engineered a network of winter ice roads throughout the Northwest Territories to service various mines (including Port Radium, Discovery Mine, and Tundra Mine). 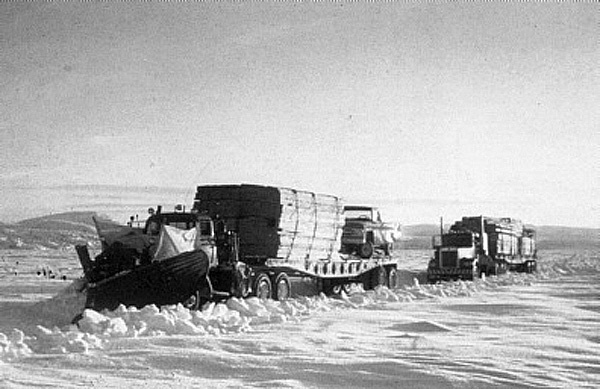 While Denison was not the first to attempt truck freighting on winter roads into Yellowknife (that honour goes to Al Hamilton of Grimshaw Trucking in the mid 1950s), he perfected the art of constructing ice roads and built them into some of the most isolated parts of the sub-arctic. His major interest was hauling around large buildings on ice roads between mining camps. Denison's exploits were the topic of Edith Iglauer's non-fiction book, Denison's Ice Road (1974).